With only a few days left until WWDC 2013, Apple has issued an update to their Operating System software to bring the version to OS X 10.8.4. Users had been reporting a variety of issues from trouble connecting to some WiFi networks or problems with conversations in the Messages App being out of order. In the OS X 10.8.4 update, released on Tuesday, Apple says these various issues should now be resolved. OS X 10.8.4 is said to improve compatibility for connecting to enterprise WiFi networks as well as fixing the issue with messages appearing in a non-chronological order as previously mentioned. It also fixes a problem where FaceTIme calls could not connect to users outside the US correctly. 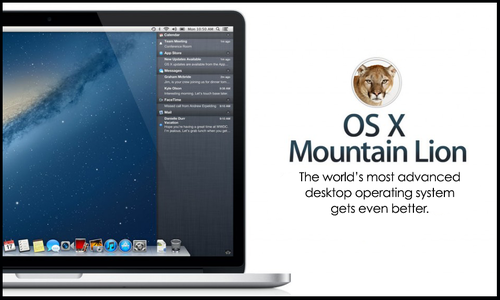 Apple is expected to release the next version of its OS X software – 10.9 – next week at WWDC 2013 which will undoubtedly bring a whole load of new functionality, so it is no doubt that Apple wanted to squash these bugs before a new version of OS X hits. Fire up your App Store on your Mac now to download the update.